Reflecting back on a career filled with greatness, it’s tough to pick out any single instance that a player will remember forever from the thousands of highlights and great games that he may have had. This is especially true for former Colorado Mammoth player John Grant Jr., whose career is littered with great moments, championships, and even hardships. Interestingly enough for Grant Jr., a pro career in lacrosse wasn’t originally his plan. There was a chance that the lacrosse world have never witnessed Grant’s extraordinary talent, as he found himself weighing it against going to school or even giving hockey a try. He was drafted by the Buffalo Bandits in the third round of the 1995 MILL Draft, opening up the possible start of his pro career, but after some consideration, he forwent the opportunity and instead opted to go to college and earn a degree. “But that’s why I realized when I was drafted by Buffalo that I wanted to get a degree, and I wanted to find every possible way to go play in the NCAA and use lacrosse as an opportunity to get that degree when I wouldn’t be able to otherwise,” Grant Jr. said, regarding the thought process behind his decision. Grant Jr. instead enrolled at the State University of New York at Morrisville. He stayed at SUNY Morrisville for two years before transferring to the University of Delaware. He played the 1998 and 1999 season with Delaware, going 23-8 across the two seasons and earning a USILA National Collegiate Player of the Year award. He took the team to their first quarterfinals appearance in the NCAA tournament, as well as their first 14-win season. But as his college days were winding down, Grant Jr. found himself once again at a crossroads when it came to lacrosse. 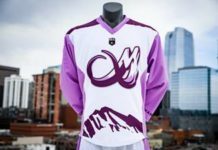 Hockey was no longer in the equation, but a reformed National Lacrosse League had appeal that couldn’t be overlooked this time around. So after finishing his final two years at the University of Delaware, Grant Jr. reentered the draft. He was drafted once again, this time first overall by the Rochester Nighthawks. He went on to have a strong rookie campaign, finishing with 37 goals and 40 assists in 12 games played. Even though he was coming from college-level lacrosse, the transition seemed relatively seamless for Grant Jr. The Nighthawks finished the season with an 8-4 record, third-best in the league, then defeated Buffalo to go to the Champions Cup finals. 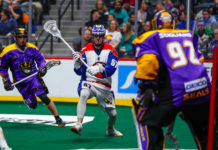 Rochester went on to finish second to the Toronto Rock, and Grant Jr. was named Rookie of the Year. But despite the wealth of experience he had going in, as well as the experience gained during his successful first-year campaign, there was still more to learn as his game evolved from being central on his own play, to being more focused on teamwork with the high-caliber players he was now surrounded by. “That was the adjustment. Where [in] Peterborough for a few years, we were pretty lean, there was only 30-40 people at the games, we didn’t really even have full rosters for most the of the time, and I kind of felt like I had to take things into my own hands and do everything on my own. It wasn’t until I got to Rochester where I started to learn how to play a team game and be part of a team game,” he said of his evolution. Rochester finished second that year to the Toronto Rock for the Champions Cup. Grant Jr. improved year over year and battled injuries until 2007; his breakout year not only with Rochester, but within the box lacrosse world. Despite a rocky start to the season, the Nighthawks went on to win the Champions Cup while Grant Jr. put together an MVP season of 51 goals and 60 assists. He wasn’t done there, though, as he returned to Team Canada to win the World Lacrosse Championship soon after, and then the Mann Cup with the Peterborough Lakers — where he earned MVP for the series. He also earned a league MVP in the MLL outdoor league with the Rochester Rattlers, but the team lost in the semifinals of the playoffs. That drive carried Grant Jr. to win several more cups and personal awards in multiple leagues. 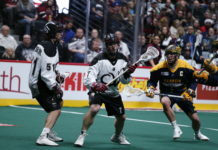 Then, in 2010, a big trade sent both Grant and teammate Mac Allen to the Colorado Mammoth in exchange for then-goaltender of the year Matt Vinc, along with Matt Zash and Brad Self and draft picks. Despite being an older player, the Mammoth embraced Grant Jr., and he quickly loved the organization right back. Grant Jr. went on to have his second MVP year with the Mammoth in 2012, tallying 50 goals and 66 assists and setting a new league record with 116 points in a season, while the team went 11-5 but lost in the division semi-final round of the playoffs. He followed up with three straight 91-point seasons before he wrapped up his final two years, calling it a career after only being able to play two games in the 2017 season. 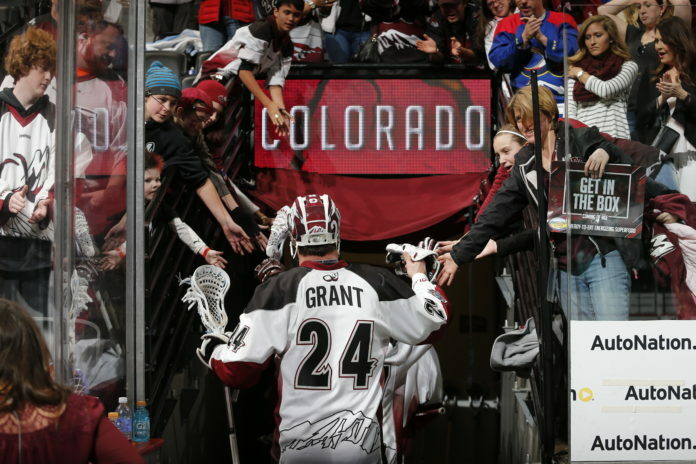 While with the Mammoth, Grant Jr. passed several career milestones, including his 1000th point and his 500th goal. He also became the all-time team leader in goals with 235, and stands in second in with 317 assists and 552 points. The Mammoth will retire his No. 24 in a pre-game ceremony during their March 24 game against the Vancouver Stealth. Grant Jr. will get one more chance to come out of the tunnel and be cheered by a fanbase he has happily embraced. The team will retire his No. 24 to the rafters, joining the likes of Gary Gait, Brian Langtry and Gavin Prout. Undoubtedly, it will be the first of many post-career awards Grant Jr. will earn, one of which might include a bid into the NLL Hall of Fame.